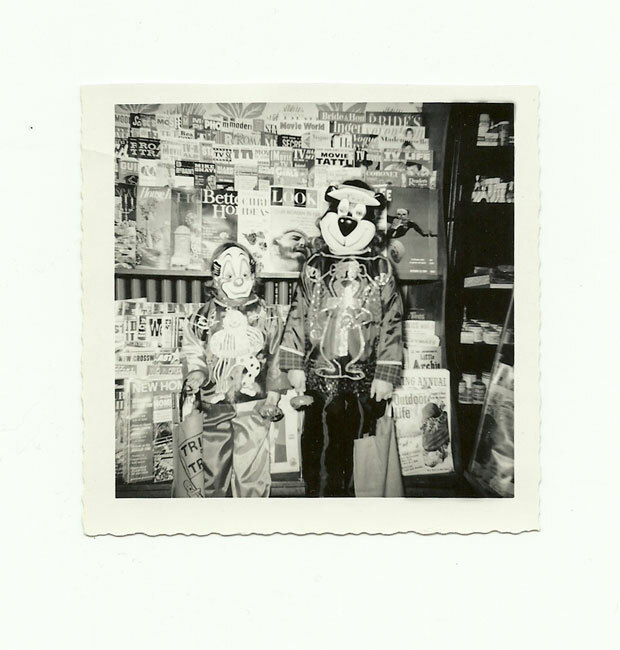 Sometime in the early 1960's, two trick or treaters stopped in front of the news-stand to pose for this Halloween snapshot. What a great photo! It combines two things I love – old magazines and Halloween. Anyone over forty will probably admit to going out on Halloween wearing one of those lame, out-of-the-box costumes at least once during their trick-or-treating years. It was so easy for parents. I know I had a Minnie Mouse costume, and Jim was Donald Duck more than once. They were made of a silky, synthetic fabric that I believe was flammable. The plastic masks were held on with thin elastic bands, but at least they were easy to flip up on top of your head for better vision when walking from house to house. By the early sixties, Hanna-Barbera was on a roll. Huckleberry Hound was introduced in 1958, and Yogi Bear became a break-out star in 1961. The older kid on the right has the cool Yogi costume; his/her younger sibling appears to be wearing a more generic clown costume. Of course, what really makes this photo for me are all of the magazines on display behind the kids. It looks like Fidel Castro is on the cover of the “Look” magazine. This could very well be from Halloween 1962, in which case the Cuban Missile Crisis had, literally, just ended. The kids, however, probably don’t care. They just want to load up on those nice, full-size candy bars that everyone got back then – and avoid the apples at all cost! This entry was posted in 1960's, Americana, Carol, Comic Characters, Costumes, Ephemera, Halloween, Holiday, Humor, Uncategorized. Bookmark the permalink.